How did people express themselves through objects in the colonial Americas? How did those objects reflect different meanings and uses? What were the political, social, cultural, economic and religious implications of their use by indigenous communities? How did they affect and shape colonial and post-colonial identities? This seminar explores such questions by focusing on clothing and their wearers during the colonial period, and by comparing colonial apparel with today’s indigenous dress and body adornments. Topics will include colonial power and its relationship to the usage of apparel, the choice of hybrid attire by certain indigenous protagonists for social advancement, the use of clothing for subverting colonial power, and the associations of specific clothing with indigeneity in various parts of Latin America today. Students will gain working knowledge of material culture studies which they can apply in their own research. Graubart, Karen B. (2007). With Our Labor and Sweat: Indigenous Women and the Formation of Colonial Society in Peru (1550-1700). Stanford: Stanford University Press. Chapter 4. Rodríguez-Alegría, Enrique (2010). Incumbents and Challengers: Indigenous Politics and the Adoption of Spanish Material Culture in Colonial Xaltocan, Mexico. Historical Archaeology 44(2): 51–71. Voss, Barbara L. (2008). ‘Poor People in Silk Shirts’: Dress and Ethnogenesis in Spanish-Colonial San Francisco. Journal of Social Archaeology 8(3): 404–432. Femenías, Blenda (2005). Gender and the Boundaries of Dress in Contemporary Peru. Austin: University of Texas Press. Introduction, Chapter 3, and Conclusion. Radcliffe, Sarah A. (1997). The Geographies of Indigenous Self-representation in Ecuador: Hybridity, Gender and Resistance. European Review of Latin American and Caribbean Studies 63: 9–27. This session considers the various political, economic and social reasons behind migration waves of indigenous peoples from their territories of origin to cities during the twentieth century until the present day. Exemplified by the case of the Mapuche in Chile and Argentina, we examine the methods of repression and violence used by the state to appropriate indigenous lands for economic projects and the consequences of migration for rural communities of origin. We will discuss the relationship between indigenous migrants and the urban host society, exploring the concepts of assimilation and ethnogenesis. We examine the different socio-political strategies that indigenous peoples have followed for ethnicity (re)creation in the city, paying attention to the development of community-based organisations for indigenous culture as well as the role played by the state in this process. Finally, the session discusses the meanings of the term ‘indigenous’ in an urban society which is shaped both by the hold of the past on the present day, and the speed of modernity and globalisation. Radcliffe, S. (2017). Geography and indigeneity I: Indigeneity, coloniality and knowledge. Progress in Human Geography, Vol. 41(2) 220–229. Warren, S. (2017). Indigenous in the city: the politics of urban Mapuche identity in Chile, Ethnic and Racial Studies, 40(4): 694–712. Sepúlveda, B and Zúñiga, P. (2015). Geografías indígenas urbanas: el caso mapuche en La Pintana, Santiago de Chile. Revista Geografía Norte Grande, 62, 127-149. This seminar considers the ways that arts, crafts and other forms of material culture have been central to the production of racial and ethnic categories in Mexico. Immediately after the Mexican Revolution (1910-1920), the state heavily promoted the idea that Mexico was a proud and strong nation because it was born from the mixture of two great cultures: Spanish and Indigenous. This ideology of mestizaje became an important theme for artists in the early- to mid- twentieth century and remains so today. At the same time, cultural elites began to consume the handicrafts (artesanías) of indigenous groups as a way to symbolically connect with what they saw as authentic traditional cultures. Today, arts and crafts remain a significant aspect of the identities and economies of many indigenous groups, while indigenous and other actors may use the symbols and forms of indigeneity to call for political change. At the end of the session, students should have a good understanding of how historical and contemporary practices of art production and collecting contribute to understandings of race and ethnicity in contemporary Mexico. They should also have an appreciation of how art markets impact these processes, as well as an understanding of how art has been used as a political tool by different kinds of actors. Gruzinski, S. 1995. 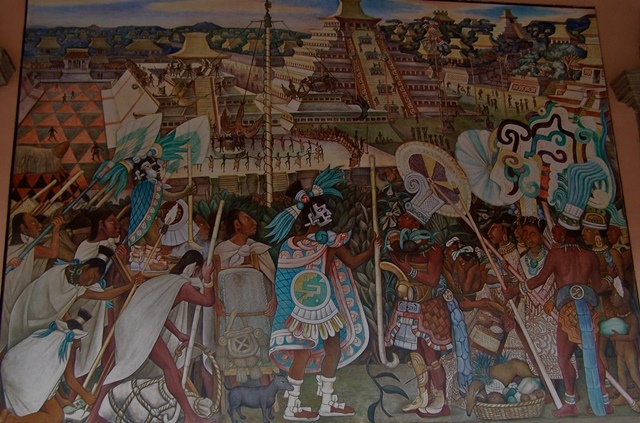 Images and Cultural Mestizaje in Colonial Mexico. Poetics Today, 16(1), 53-77. This session addresses the role of Christianity in the experiences and identities of indigenous peoples in the Andes and Central America (or ‘Mesoamerica’; including southern Mexico). In both regions, many traditional practices of indigenous groups are also features of ‘popular’ Catholicism, such as the worship of the saints, cofradías (religious brotherhoods), and the celebration of fiestas (ritual feast days). These practices may be blended with, or practiced alongside, other non-Christian indigenous forms of worship. Since the 1970s, Protestant churches, many originally from the United States, have made significant in-roads across Latin America. Conversion to Protestantism has deeply affected some indigenous communities, where conversion can undermine traditional forms of social organisation that are grounded in Catholicism. At the same time, some indigenous peoples find within Protestantism new ways to negotiate the political, economic and social issues that they face. In response, the Catholic church has also engaged with indigenous peoples’ concerns through ‘indigenous theology’ movements. At the end of the session, students should have a good understanding of how popular Catholicism and indigeneity are interconnected in the Andes and Central America; the social effects of Protestant conversion; and how Catholicism and Protestantism have been related to indigenous politics in the contemporary period. Tassi, Nico 2012. ‘“Dancing the Image”: Materiality and Spirituality in Andean Religious “Images.”’ The Journal of the Royal Anthropological Institute 18(2): 285–310. In the first of two lectures on generic social and cultural processes that create the contours of indigeneity in Latin America, the focus is on shamanism as a set of practices that carry a distinctive indigenous label but at the same time have been defined through dialectical relations between Indians and the dominant society since colonial times. Themes include the relationship between Christianity and Amerindian cosmologies, shamanic knowledge and its use in mediating racial conflicts, shamanism as popular medicine and popular culture in mixed rural and urban populations and the blurred identities of present-day shamans as they claim and/or ‘perform indigeneity’. Materials range from the Colombian rubber boom to Peru’s expanding Ayahuasca shamanism, the emergence of Shuar shamans in Ecuador and the complex gendered identities of Mapuche shamans in Chile. There are two guiding questions: what does shamanism tell us about indigeneity as relational politics in which people ascribed as indigenous are both socially and economically disadvantaged and yet are attributed powers sought by non-indigenous people on local and international scales? How can we explain that what we call shamanism, in its many different forms, continues to re-invent itself as a live counter-hegemonic cultural heritage throughout Latin America? In contrast with the culture of shamanism in which race relations are virtually inverted and redeemed in the Latin American popular imaginary, this second lecture addresses how children grow up ‘indigenous’, looking at how indigeneity is constituted from birth as warranting ‘development’ from outside, while being affirmed implicitly from within communities. While present-day health and education programmes of ‘interculturality’ in Amazonia and the Andes overtly support cultural difference, following a postcolonial trend of ‘indigenismo’, schools and health posts are ambivalent spaces in which parents and children negotiate their indigenous identities in everyday life. Themes include the making of Amerindian personhood as distinctive, the politics of primary education and primary health care and the emergence of indigeneity over ethnicity as an analytical concept to denote ontologies of difference. The guiding questions are: how are tensions between embodied, oral and implicit cultural norms of indigenous socialization and the discourse of indigeneity reconciled? Are there shared features of indigenous personhood in Amazonia and the Andes? What is the relevance of politics of place or territory to the affirmation of indigeneity in the fluid social ‘mestizaje’ of the poor at the grassroots?